Drawstring collar and waistline. Size : Small (Bust-36"). This is for DD Dakota Trench Jacket. The jacket is bright red. It is lined in red. It has buttons up the front and is belted. It has side pockets. It has long sleeves. Luxurious Chocolate brown reversible coat by Venezia. Rain coat like material on one side, furry on the other. Shoulder to shoulder: 18". Sleeves: 25"'. Armpit to armpit: 24". Waist: 24". Arm 22” shoulder 16.5 length 27.5 waist 17 chest 20. 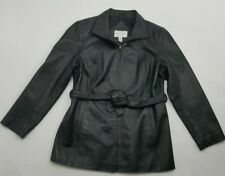 This is a beautiful ~ rich black ~ 100% Genuine Leather ~ full zip front ~ lined ~ jacket by Worthington. Top of collar-hem: 27.5". >>> GREAT condition <<<. Chest (pit-pit): 38". Waist: 36". 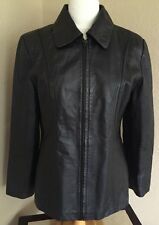 Worthington Womens Petite Leather Coat. Color - Black Size - Medium Width - 17" Length - 28" Sleeves length - 23" Item is in very good cosmetic condition. Cotton Trench Coat With Plaid Check Upturn Collar. Lined in classic plaid cotton in beige, black, white and red. Outer Cotton in Beige / Tan. Back Rain Guard with button. Collar Hook Closure. Superb Quality and Classic Style - LAST ONE! Chest - Armpit to Armpit: 21. Length - Shoulder to Hem:31. The item photographed is the exact item you will receive. STYLE: Biker jacket refined for the boardroom. - zip front (silver tone zipper and tab) - maroon lining - collar can fold over or zip all the way up. 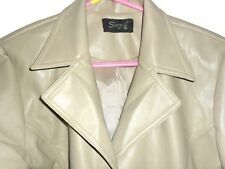 FABRIC CONTENT: 100% leather - the lining is 100% polyester. Removable zippered hood. Coat jacket is collared without the hood. Material: 100% Leather Outershell, Lining: 100% Polyester, 100% Nylon, 100% Polyester Padding. Wrist: 4" across at widest snap setting. 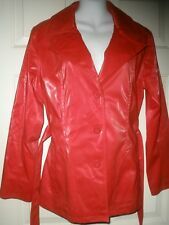 Comfy smart coat easy to wear light weight faux leather waterproof size 16. Leather PVC. PVC PU Skirts. PVC PU Trousers/Pants. PVC PU Jackets. PVC PU Coats. Chest 38ins 97cms(-1ins/2.5cm). Chest 42ins 107cm( 1ins/2.5cm). 40ins 102cms around CHEST (Pit to Pit). 38ins 96cms around CHEST (Pit to Pit). Chest 38ins 96cms (Item size ). Chest 37ins 94cms(-1ins/2.5cm). Chest 39ins 99cms( 1ins/2.5cm). 17ins 43cms across the SHOULDER. Leather PVC/PU Satin. LEATHER Skirts. 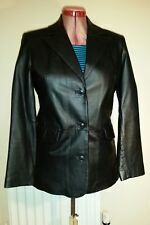 ZAHRA Ladies Girls Black Soft Real LEATHER Hip COAT Pelle Cuir Leder Cuero Fetish TV/TS/TG/CD Size uk12 eu38 us8 Chest 36ins 91cms (042720020900). 36ins 91cms around CHEST. Chest 36ins 91cms (Item size ). Fashionable Faux Leather Look PVC Coat with Faux Fur Collar in Black. Do not wash in washing machine, instead sponge clean. EAGLES Black Real Soft Leather Leder Cuir Cuero Pelle Coat Size UK18 EU44 US14 Chest 43ins 109cms. Shoulder to Shoulder 18ins / 46cms. Chest 43ins 109cms (Item size ). Chest 42ins 107cm(-1ins/2.5cm). Chest 44ins 112cm( 1ins/2.5cm). Very nice jacket, Perfectly suitable for any occasion. I promise to do in my power, above & beyond to assist in every way I can. excellent condition. 1 button missing on front. easily replaced. evening wear/wedding/formal. Used:An item that has been previously worn. This is a navy coat with black faux leather quilted sleeves. It buttons up at the front along with two toggles to be done up. There is also a hood with buttons round the neck to do the coat up all the way. NEW LOOK Black/White Spotted PVC JACKET Festival Fetish Vegan Size S Chest c36ins c91cms. Skirt Hem Circumference xxins xxxcms. L eather PVC. PVC PU Skirts. PVC PU Trousers/Pants. PVC PU Jackets. PVC PU Coats. A couple of marks/scuffs. Sleeve seem, approx. And purple silky lined, looks and feels like leather but it faux pvc o. This is awomans purple shiny faux leather pu jacket by New Look. raincoats, mackintoshes, rubber suits TV clothing nylon overalls wigs, the lot. This is astunning shiny black wax looking faux leather trench coat, bang on current fashion length. raincoats, mackintoshes, rubber suits TV clothing nylon overalls wigs, the lot. This is astunning soft brown leather winter coats with faux fur trimming by For Woman. shiny brown soft leather fur lined hood and roll back cuffs, ideal for this coming season. classic winter styling, warm and real leather NOT pvc. This is really fine woman's black pvc faux leather biker jacket with black silky lining. raincoats, mackintoshes, rubber suits TV clothing nylon overalls wigs, the lot. we list daily so keep checking back for more.